Both practical and inspiring, this poetry collection offers a new way to approach biblical lessons in a quickly evolving world. 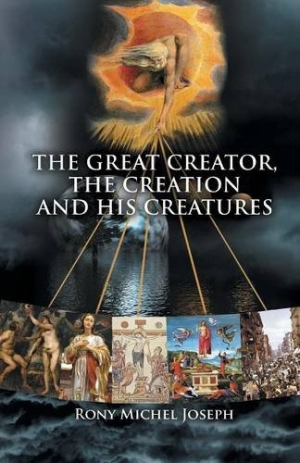 The Great Creator, the Creation and His Creatures is a collection of biblical poems by Rony Michel Joseph. By turns fierce and soothing, Joseph’s words offer guidance, new perspectives, and religious support for people seeking to grow closer to God. With an emphasis on devotion and practical advice for life, Joseph’s poems read like portable sermons, bite-sized spiritual nuggets for believers. Joseph has a clear and confident voice. His familiarity with his subject—how to live well according to biblical law—comes through strongly. The message of each poem is simple and straightforward, presented in ear-catching rhymes. Sharing spiritual axioms in this way makes complex concepts accessible to people at all stages of their spiritual journeys. The natural rhythm of the prayers make them memorable, uncluttered, and appealing in their simplicity. A flowing, conversational writing style offers easy access to Christian principles. Rather than jumping straight into Joseph’s personal interpretations of the Bible, many of the poems in The Great Creator are headed by a piece of scripture, or in some cases a quote from Wikipedia or a scientific paper found through a search engine. Images and clip art illustrate each poem’s theme and can be distracting: the book jumps from pictures of the life of Christ to those of armed soldiers, the somatic nervous system, and handfuls of money. Material from Sathya Sai Baba offers some balance, grounding the work in an existing spiritual tradition. Although The Great Creator deals primarily with biblical interpretation, its approach is humane and universal, applicable to many spiritual paths. A section on silence and meditation, for example, includes quotes from Eckhart Tolle and other spiritual teachers. Joseph’s collection The Great Creator, the Creation and His Creatures is full of touching, passionate poetry for spiritual seekers. This compact, concise book is both practical and inspiring, offering a new way to approach biblical lessons in a quickly evolving world.